With thousands of installations across the globe, Fluence has the expertise to build treatment plants to address a wide range of wastewater challenges. Tipton Series extended aeration packaged plants are designed for applications that require reliable, robust and cost-effective primary, secondary, and tertiary treatment solutions, all in a compact, portable, self-contained, and odor-free package, which can be shipped quickly to any customer, anywhere. Plants can be custom-configured for each project. Tipton Series packaged plants are flexible and simple to operate in the field, and are designed to minimize installation and startup costs. Smaller systems come completely assembled, plumbed and wired for immediate, low-cost installation and startup. Tipton Series plants are typically used in hotels, resorts, and parks, as well as school campuses, small communities, remote mining and construction sites, and military bases – wherever there’s a need for wastewater treatment on a smaller scale. Prefabricated packaged plants are available with flow rates from 200 to 350,000 GPD (0.76-1,330 m3/d). Field-erected packaged have a flow rate ranging from 50,000 to 2 million GPD (189-7,570 m3/d). Every packaged wastewater treatment plant is designed to meet or exceed the effluent discharge limits for its specific location. Tipton Series packaged plants are fabricated from high-strength, reinforced carbon steel and are coated to allow the plant to be fully buried or installed at grade level without requiring additional structural support. The interior and exterior surfaces of the plants are factory-coated with a superior epoxy paint, and plants are equipped with sacrificial anodes to protect against galvanic action and corrosion. Fluence customers enjoy a long service life from their properly installed and maintained treatment plants. In order to address stringent effluent standards, our design team can select and engineer the following treatment options to achieve excellent removal rates of BOD, TSS, and nutrients. If you’re looking for a reliable, robust, easy-to-deploy wastewater treatment facility, a Tipton Series prefabricated or customized plant could be the ideal solution for your operation. Our experts can properly size and configure a packaged plant for your application. Contact Fluence to learn more about our packaged wastewater treatment plants, or to discuss your specific project details. Contact us to learn more about our packaged wastewater treatment solutions, or to discuss your next project with our experts. 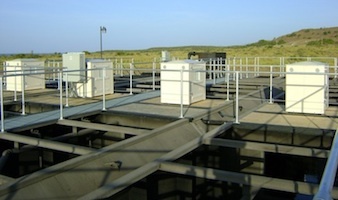 Fluence supplied a 300,000 GPD advanced extended aeration wastewater system to treat domestic waste at the U.S. Air Station at Guantanamo Bay, Cuba. This system was designed to meet the effluent requirements for discharge into the ocean. An additional requirement was that 35,000 GPD had to be treated for reuse as grey water. All of the necessary equipment, including 12 prefabricated steel tanks, were shipped on one barge. Fluence was also responsible for the start-up of the wastewater treatment system and for training the base personnel to operate it properly. When a mine in Mexico was reopening, it needed a fast, reliable wastewater treatment system. 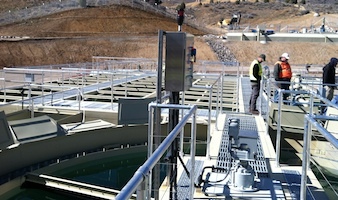 Fluence provided a packaged wastewater treatment plant. 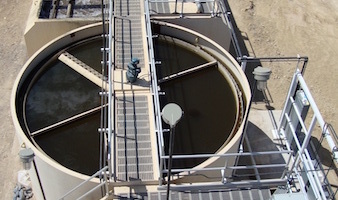 The wastewater treated in this facility is used for dust suppression around the mining operation, and the concentrated sludge can be safely handled.